However, these pics are NOT from this past week....no, in fact, these are from Mother's Day weekend, which, yes, I know, was a month ago now. I have been trying to get them on the blog, but stuff just kept coming up that took priority over me being on the computer. Anyway, we really had a great time that weekend. 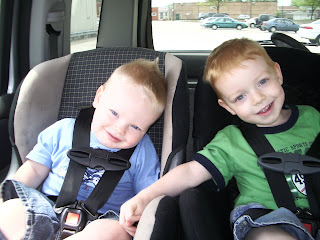 On Saturday afternoon, Shane and I took the boys to Midway Airport to watch the planes take off. 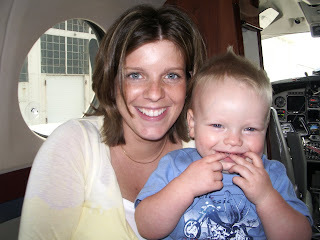 We got to see lots of planes, and we discovered that we were parked right by a private jet. 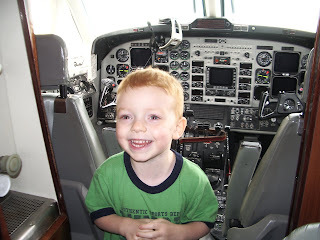 Shane made small talk with a man who was near our car, and he asked us if we had any "future pilots" in our car, and would they like to see the inside of his jet? How cool! We got to go inside the jet, which turned out to the be the private jet of the governors of Illinois, past and present. It was the taxpayer's plane, and this man was the pilot. He basically flew around all the important people in IL. He gave Colin and Cameron the tour (us too) and the boys just loved it. 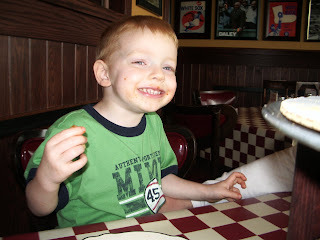 After that, we went to our most FAVORITE pizza place in all Chicago--Giordano's Pizza! 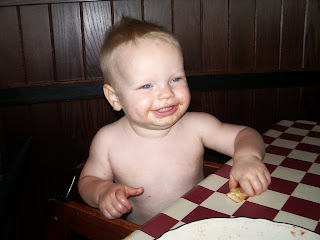 The boys loved the pizza, but I can honestly say that they didn't love it quite as much as their mommy and daddy! Ethan was a gem the entire time as well. All in all, it was a GREAT weekend in Chicago! Slides of our first Chicago trip!